In Massachusetts, the North Reading Patch reports that Kristen Shevlin has been building back yard vegetable gardens for residents as part of her Girl Scout Gold Award project. She is doing this free of charge, and plans to continue next year. The raised gardens contain vegetable plants including tomatoes, cucumbers, squash and peppers. She realizes that a backyard garden can take up a lot of space, so also offers potted gardens. This year, she planted around 15 or 20 gardens. Some of the residents plan to donate what they grow to the North Reading Food Pantry. 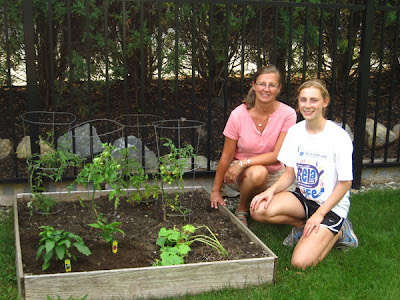 She also planted some directly in the yards of residents who go to the pantry regularly. “I had a lot of help with this, but so far it has been really successful," she said. Right now, she is working on creating a website for the project to keep it sustainable for years to come. If she is unable to complete it when she goes off to college, she can pass it on to another girl scout. The website will have a description of the project, her contact information for future years and instructions on how to build your own garden. She is also creating recipe cards for members of the pantry so they will have various ideas for how to cook the vegetables.